Venus Williams’ Amazing Reaction To Advancing In The Australian Open Is Everything! In an adorable viral clip, Venus Williams reacts to advancing to the Australian Open, where she’ll compete against her sister Serena. On Thursday, Venus Williams beat her opponent in the Australian Open Semi-Finals and made history doing it. She’s now the oldest Australian Open singles finalist of the modern era and the second oldest to play a Grand Slam final. After her recent victory, she expressed her excitement in a joyful twirl on the court in a viral video clip. 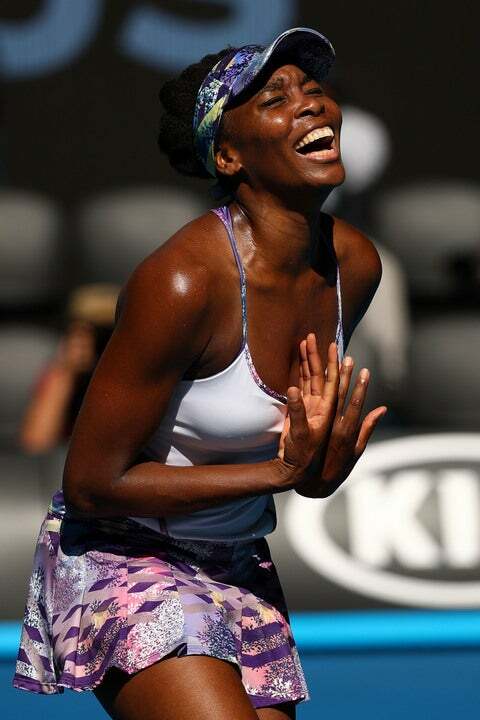 Thirty-six-year-old Venus’ victory against CoCo Vandeweghe will advance her to the finals to play against her sister. Venus has a total of seven Gland Slam titles, while Serena holds 22. The sisters combined have more than any other active female player, The Guardian writes. Serena, who only lost three games in her win against Mirjana Lučić-Baroni, advanced to the finals as well. Following both of the women’s recent triumphs, it’s destined that one of the Williams sisters will take home the trophy this year. The sisters will compete in the final of the Australian Open in Melbourne on Saturday. According to reports, this year will mark the 15th time the two will compete against each other in a Grand Slam and the ninth in a major final. The last time the sisters went head to head in a Grand Slam was at Wimbledon in 2009. “No one has ever beaten me as much as Venus has. She has a pretty good record against me, and we have a good record against each other. I just feel like, no matter what happens, we’ve won,” Serena said. The final will air Saturday at 3:30 a.m., if you can manage to stay awake!